Marriott had joined the Clarets on loan two games into the season and become a big crowd favourite as the team soared up the table with an astonishing run of wins. 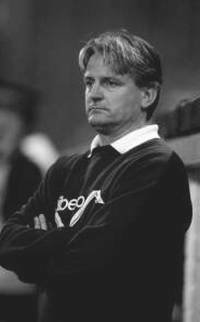 New manager Jimmy Mullen, still to make a signing of any kind, vowed he would do all he could to make Marriott his first. There had, apparently, been encouragement from Forest and their manager Brian Clough that Marriott would be available and Burnley thought they were very close to getting him for what would have been a club record with a final offer. That record had stood at £165,000 for over thirteen years when Leighton James returned from Queens Park Rangers. Unfortunately, Clough had been playing games with Burnley and had, it transpired, no intention of selling him but was playing the loan market to his advantage to get three months football for his goalkeeper. Mullen was devastated as he asked for understanding from the fans: "I can't say how disappointed I am," he said. "We have done everything we can to get Andy Marriott to the club. "The board and myself have done everything in our power to sign the lad but Forest have made it crystal clear that they won't sell him, no matter what." The manager agreed with the fans that it was a blow for the club and added: "The lad himself is very disappointed. He would have dearly loved to come to us on a full time basis but money doesn't seem to enter into the argument. Forest just will not let him go. "It's perhaps that he has been too successful here. Forest will have been watching him every time he has played and they must be impressed, but that's life and you just have to get on with it." The good news for Burnley fans was that Marriott would not be leaving immediately although he had made his last Turf Moor appearance. As part of the terms of his loan he would still be available for the next two league games at Maidstone United and Northampton Town but would not, again, be allowed to feature in the FA Cup with Burnley facing Doncaster Rovers in a first round replay. There was news also of a change to the forthcoming friendly against Russian side Dynamo Stavropol. This game had now been put back a week from Tuesday 26th November to Tuesday 3rd December. This was due to a change in Stavropol's tour itinerary although the original date was just 24 hours before the cup tie at Doncaster. Burnley would not be opening the terracing for this game but confirmed that the cricket field stand would be open to all, not just its members. Admission was set at £4 (£2 concessions) in the Bob Lord Stand and £3 (£1.50 concessions) in the cricket field stand.